Welcome to the third of my detailed write-ups of this year’s London Coffee Festival (if you want an overview of the whole festival, take a look at my round-up). Here I cover individual aspects of the festival, starting with some automatic filter machines and continuing with last week’s look at cups. This week I’ll be casting my eye over some of the other kit I found, before covering, in future Saturday Supplements, my coffee experiences and the coffee itself. I’ve already looked at one specific aspect of the kit, the surprising proliferation of automated filter/pour-over machines, which I covered two weeks ago. This time it’s a round-up of various miscellaneous bits of kit that I came across, starting with my surprise favourite, the automated bean-counting machine. Another area which particularly excites me, as a coffee shop customer, is the emergence of the modular espresso system, typified by the Mavam, which made its London Coffee Festival debut this year. Finally, I take a look at top-end grinders which are making espresso extraction ever more reliable. In this instance, it’s the Mahlkönig Peak, which was launched the festival. We’ll start with my favourite bit of kit from the festival, which came as something of a surprise: it’s a bean-counting machine! This does exactly what it says on the tin: it counts beans. Although if we’re being pedantic, technically, it weighs them. Okay, to be precise, it dispenses an exact dose of beans to a pre-selected weight. Place a receptacle on the scales, select the desired dose, hit go and out pop the beans, to within 0.1g of your target weight. An “automated machine for dispensing beans to a pre-selected dose” in fact. You can see why I went with “bean-counting machine”, can’t you? My first reaction was “what’s the point of that?” quickly followed by “that’s genius!”. In case you’ve missed the logical steps between those two statements, let me explain. If you run a coffee shop and all you do is espresso, a bean-counting machine is probably of little use to you: your shiny, auto-dosing grinder (see below for one such example) will take care of that for you. Even at home, it’s probably of little use. After all, I’ve already got a bean-counting machine: it’s called me (and my scales). Which is fine, as long as I’m making coffee one at a time. Enter the beaning-counting machine. Put the receptacle on the scales, select the weight, hit go and bingo, job done! Admittedly, it won’t be for everyone, but in certain circumstances, I can see this being an amazingly simple labour-saving device. Although there were quite a few major espresso machine launches at the London Coffee Festival this year, for various reasons, I didn’t get around to seeing any of them. The one espresso machine that did catch my eye, however, was the Mavam, a rival to the Modbar system from La Marzocco. These two revolutionary espresso systems (although the Modbar also has a pour-over module in addition to its espresso modules) have taken the traditional espresso machine, comprising of boilers, pumps, steam wands and group heads (usually in one hulking great machine), and split it into its constituent parts. While that might not sound like much, modularising the espresso machine has one major advantage: the bulk of the machine (the boiler and the pumps) can be mounted below the counter (or anywhere you like, really), leaving just the steam wands and group heads to rise majestically out of the counter, somewhat akin to the familiar beer tap. While this might not initially sound like a big deal, I think it has the power to revolutionise the service of coffee in the traditional café/coffee shop setting. The bulky nature of the espresso machine has always been an issue, no matter where you put it. On the counter, it ends up hiding both the process of making coffee and the actual barista from the customer. Mount it to the side or behind the counter and, while the customer can see what’s going on, you take the barista away from the customer, reducing the chances for interaction. With a modular espresso machine, which just has steam wands/group heads on the counter, you’ve suddenly removed the single greatest barrier between both customer/barista and between the customer and the process of making coffee. Instead, everything’s on display. Of course, it won’t be right for every coffee shop/setting, nor will every customer be interested in either talking with the barista or watching espresso shots being pulled. However, in what is essentially a service industry, I think that anything which improves the ability of baristas to engage with their customers is a good thing. So, that’s the sales pitch for the modular espresso machine. What’s so special about the Mavam? Well, it’s another entrant into the market, single-handedly doubling the available options, which can only be a good thing. Right now, with demand vastly outstripping supply, another manufacturer entering the fray can only help. Beyond that, Mavam’s particular claim to fame is that it every element is temperature controlled. A big concern with any modular system (and, for that matter, any espresso machine, although this is exacerbated when you have separated the components) is heat loss between the boiler and group head. Considerable effort has been expended by espresso machine designers over the years to ensure that this is minimised. After all, there’s no point in the boiler pumping out water at exactly the right temperature to have it lose a few degrees by the time it gets to the group head. The Mavam addresses this by providing electrical heating elements in each of the components. These are individually programmable, so no matter what the set-up, the barista can ensure perfect temperature stability throughout the system. Having managed to miss most of the new espresso machines, I accidentally ran into the main grinder launch at the London Coffee Festival, that of the Mahlkönig Peak. Mahlkönig is already a big name in the grinder business, its K30 grinder going toe-to-toe with the Nuova Simonelli Mythos 1 as the grinder of choice at the top end of the specialty market. It also made a big splash a few years ago when its EK43 grinder, with its vertically-mounted burrs, started appearing in speciality coffee shops around the world. The latest innovation is the Mahlkönig Peak, a set of EK43 burrs mounted in a K30 body. I’ll spare you the technical details (I’ll leave that to the Mahlkönig site) and just stick to the basics. The reason people were so wowed by the EK43 was its consistent grind-size. In an ideal world, you’d set the grind-size and everything would come out ground to exactly that size. However, the real world’s not like that: put simply, any grinder will produce a range of particle sizes. This is important because different sizes of ground coffee will extract at different rates: some will over-extract and some under-extract. This can be really crucial in espresso, where the water will channel through the larger, less densely-packed particles, exacerbating the unevenness of extraction. So, the narrower the distribution of particle sizes produced by a grinder, the more even the extraction. As I said, the EK43 gained a reputation for produce a very consistent grind-size. So, the obvious question is why not just use an EK43? Well, for one thing, the EK43 doesn’t have a doser (see my comments on the bean-counting machine), so in a busy coffee shop, it really slows down production. EK43s are also big beasts. In contrast, the K30 is much smaller and has, amongst other things, advanced dosing technology (like the bean-counting machine, it will grind a specific weight of coffee, to within 0.1g). Hence the marriage of the two, producing the Mahlkönig Peak. The only reason I ended up looking at the Peak was because I ran into Darren, of Norwich’s The Little Red Roaster. He was on the Mahlkönig stand, giving demonstrations and pulling shots on a rather lovely customised Kees van der Westen. While I may wax lyrical about my Feldgrind hand-grinder from Knock, I’m really not qualified to express opinions about specific high-end grinders. Darren, on the other hand, is perfectly placed to do so. One of the first things I noticed about the Mahlkönig Peak is the lack of noise. Often in a coffee shop, if you’re talking to a barista, when the coffee gets ground, either the talking stops or the shouting starts. Not so with the Peak. It’s quiet. Really quiet. It’s also fast, grinding 16.9g in 6.5 seconds. In case you think that’s not particularly important/impressive, another barista recently told me that the single best investment he’d made in his shop was upgrading the grinders. Knocking 10 seconds off the time it took to grind an espresso shot, he said, massively improved the workflow. Another of the Peak’s claims to fame is its temperature stability and the fine control you have over the grind-size. For Darren, this is very important: the original Little Red Roaster is on a stall in Norwich market, and, particularly in winter, the operating temperature of the grinders can easily vary by 30-40⁰C during the day. Grinders, like everything else, contract when they’re cold and expand when they’re hot, changing the gap between the burrs and hence affecting the grind-size. 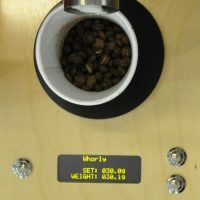 This means that the grinder requires constant adjustment throughout the day to maintain consistency: the Peak, which can tell you the precise temperature of its burrs, and which gives a fine degree of control over the burr settings, enables the barista to make the small adjustments necessary with the minimum of fuss. In fairness, there are other grinders out there which have similar features; other than incorporating the EK43 burrs, I don’t think that there’s anything unique about the Peak. I should also say that Darren had some issues with the grinder (I don’t think I’ve met a barista who is 100% happy with any grinder they own), but his overall opinion was very favourable. All I can say is that the shot Darren pulled for me, using James Gourmet’s Formula 6 Espresso Blend ground on the Peak, was excellent. Well, that concludes my look at various bits of kit from this year’s London Coffee Festival. Don’t forget to check back in three weeks’ time (next week I’ll be reporting from the Caffe Culture Show, then I’m off to Porto) for the final two Festival Saturday Supplements which will look at my coffee experiences and the coffee itself. This entry was posted in Coffee Kit, Festivals/Awards, Inner London by Brian Williams. Bookmark the permalink.